Taylor is a Marketing Specialist and part of our fabulous Campaign Team! She loves creating unique and effective content for our clients. This year, White Stone’s new campaign team has been hard at work making your monthly campaigns increasingly effective. Our creative team of content marketers and designers have been working together to craft beautiful campaigns that inspire opens, clicks, conversions, and customer loyalty. Keep reading to hear about the elements of a successful campaign, and to see some examples of fun ones we’ve been launching lately. In today’s fast-paced, digitally-driven world, getting subscribers to stop and notice your email in a sea of junk mail is a challenge. Our goal is to convey the main message within eight seconds. Eight seconds is considered “read” in the world of email marketing, and with that in mind, we’ve intentionally designed simple, visually-driven, and digestible content that is easy and enjoyable to scroll through. Colorful and fun graphics that speak to the beauty of your property inspire more clicks and overall engagement. Through testing, we’ve found again and again that having images and graphics throughout the email instead of one large graphic followed by lots of text, produces more dispersed clicks. This means subscribers are spending more time looking at your email blast and scrolling through the entire message. Here are a few examples of highly visual campaigns that received higher click through rates than their own averages, and well above the industry averages. Making your campaigns visually compelling is only half the battle. Producing personalized and actionable content is also imperative. After conducting email subscriber surveys last year, our clients received hundreds of helpful responses regarding what their guests thought of the emails they had been receiving. We found that many guests said they looked forward to receiving the emails and enjoyed staying updated on their favorite innkeepers and properties. Keep this in mind – just because each guest doesn’t book through the email, doesn’t mean they don’t see them, enjoy them, and think of your Inn the next time they decide to travel. Sending consistent high-quality blasts is an important part of fostering guest loyalty and keeping your audience engaged and coming back to your site, even year-round and between their stays. 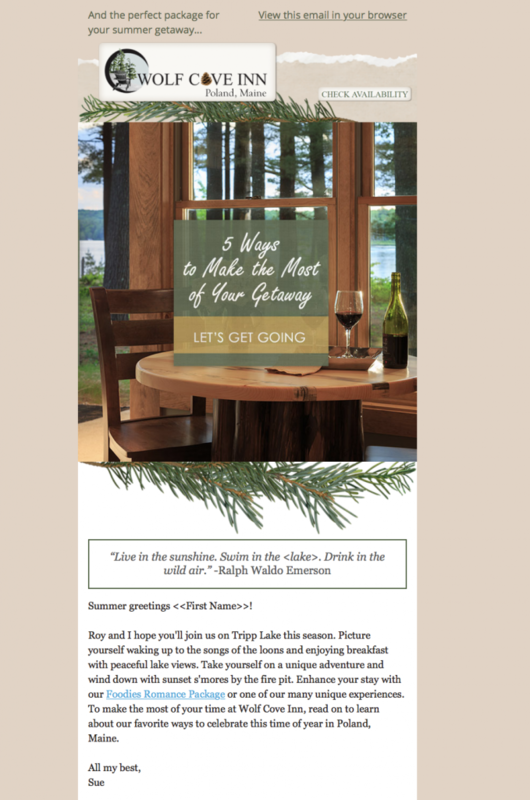 The value of an email goes far beyond clicks and conversions, the same way your Inn is so much more than a place to sleep – it’s all about the experience! Recently, we have also been making an effort to personalize blasts further with first names in subject lines and preview texts when appropriate. We have discovered through numerous A/B tests that this produces a higher open rate. We’ve also found that there are significantly higher open rates when the innkeeper(s)’s first name is included in the from name. We’ve even seen higher engagement within the email with this added personalization, and it gives the feeling that the message is coming from a person rather than a company. 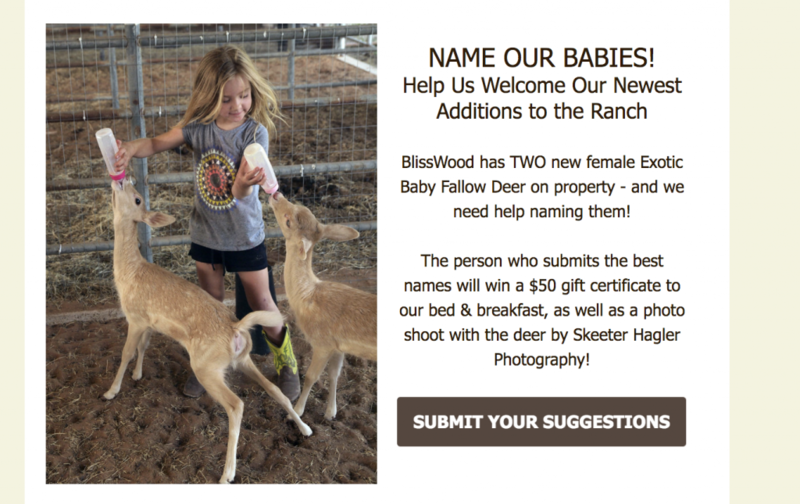 Another fun way to personalize your campaigns is by writing a note to your guests, including innkeeper or family updates, or even involving them in fun decisions like this “Name Our Baby Deer” contest below. Getting your subscribers involved through contests, personal updates, and enticing call-to-action buttons, means they are more likely to stay subscribed. Having engaged subscribers is more important than having a lot of them. No matter the size of your email list, you can make the most of it – and we’re here to help. Have some new ideas for your upcoming campaign? Talk to your Account Manager at your next meeting. We can’t wait to continue designing special campaigns for your audience each month. Happy brainstorming! We Were the First Ones to Market Bed & Breakfast Inns Online!